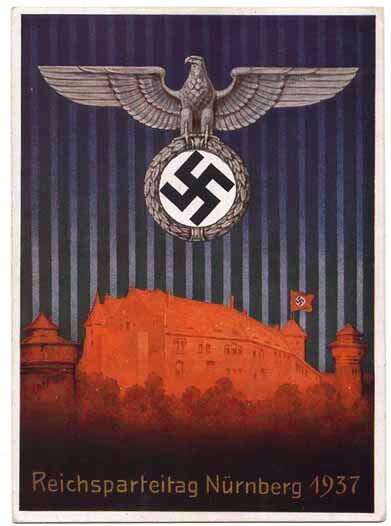 Background: The Nazis liked the visual, and postcards were cheap and vivid ways of getting the message across. The variety of Nazi postcards is enormous. A much broader selection is available on the Axis History site. The small images are thumbnails. Click on them for a larger version. 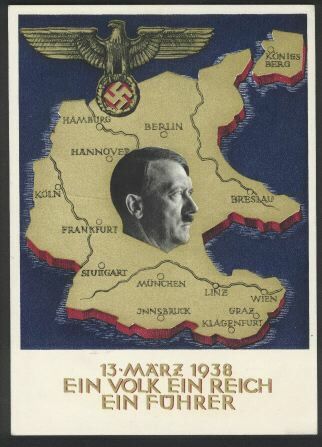 This 1933 Nuremberg Rally card puts Hitler in the center. Julius Streicher, the notorious Jew-Baiter, is to his left. To the right is Willy Liebel, Nuremberg’s mayor. 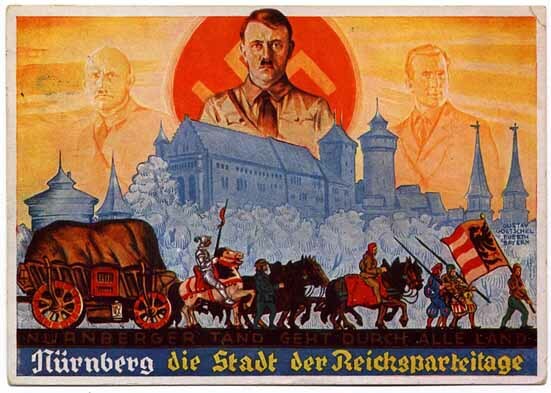 One of the reasons the Nazis chose Nuremberg as the site of their party rallies was the city’s past. 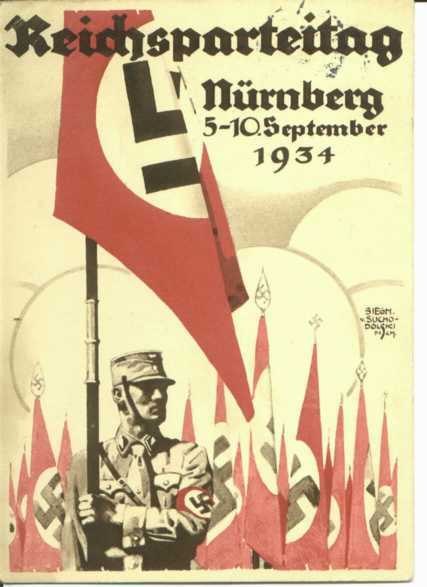 The Nazi Party itself was new, but connecting it with Nuremberg made it part of the flow of German history. 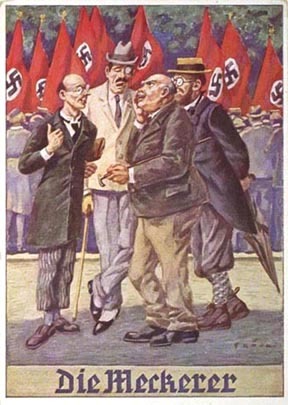 This 1934 Nuremberg Rally card emphasizes the connection of the Nazi Party to the German tradition. Thanks to Thomas Godley for the scan. 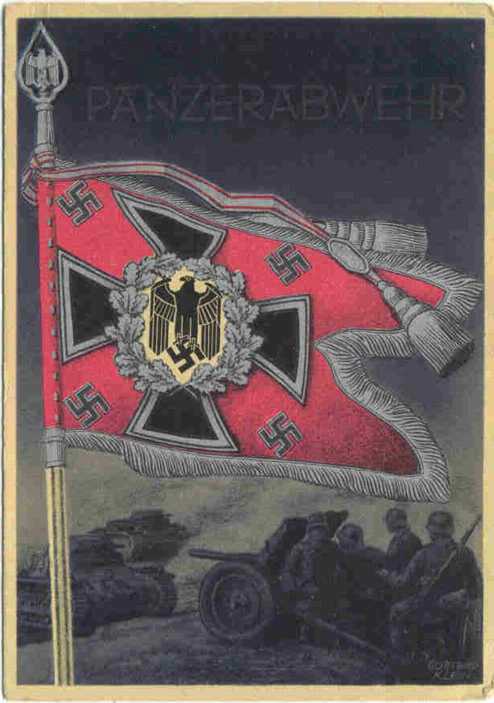 Another1934 Nuremberg Rally card emphasizes the S.A. Thanks to Thomas Godley for the scan. This 1937 Nuremberg Rally shows Albert Speer’s “Cathedral of Light” effect. Spotlights were placed around the rally grounds pointed up. The effect was apparently stunning. When Speer first proposed the idea, the military opposed it, since it required the use of about every available spotlight. Speer’s counter-argument was that if the rest of the world saw such a profligate use of spotlights at the party rally, it would assume Germany had lots of them. 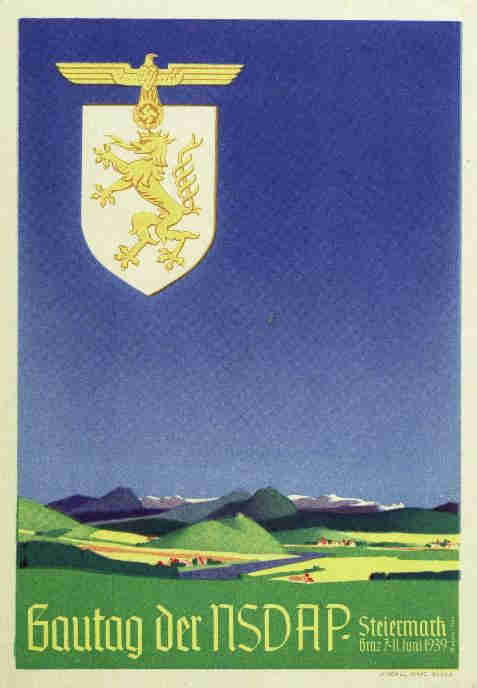 This 1938 postcard celebrates the incorporation of Austria into Germany. 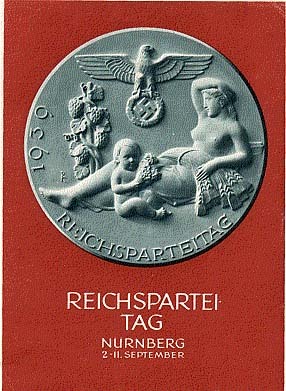 The caption reads: “One People, One Reich, One Führer”. 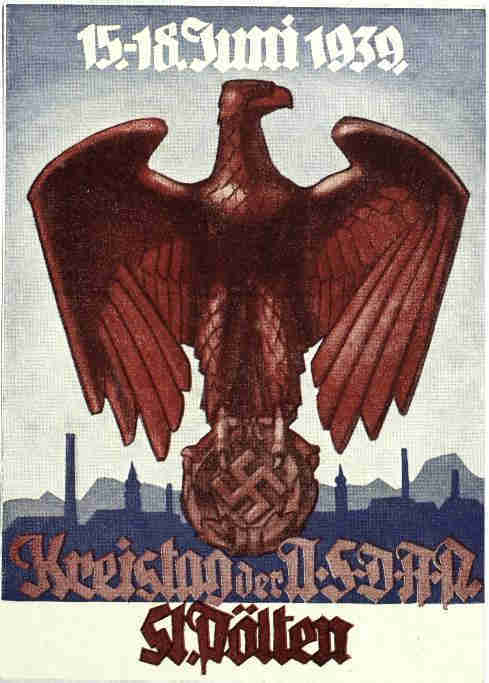 A Kreis was the term for a Nazi county unit. These held regular rallies, rather like miniature Nuremberg rallies. This is from County St. Pöltern in recently annexed Austria, commemorating the 1939 rally. A Gau was the next larger unit in the Nazi hierarchy. This one is also from Austria after the annexation.. This card, which I think dates to 1938, is a criticicism of those who criticize. Meckerer translates as complainer, with negative connotations. Four unpleasant looking chaps gather to complain while everyone else happily watches a Nazi parade. 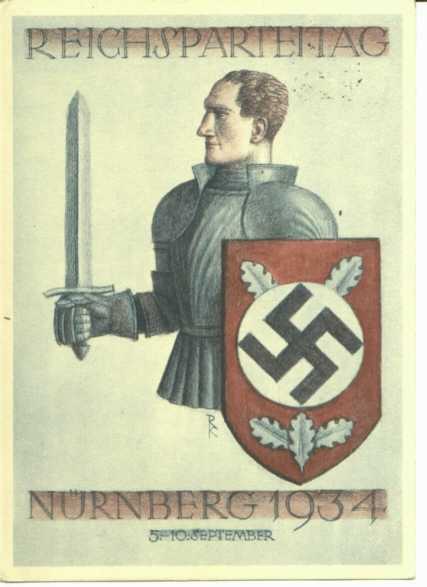 This postcard was produced for the 1939 Nuremberg Party Rally, which was to be the “Party Rally of Peace.” It was canceled upon the outbreak of World War II. 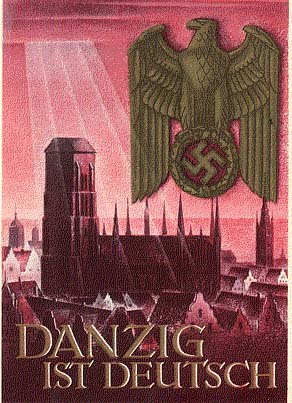 This is a late 1939 postcard proclaiming “Danzig is German.” Danzig, now the Polish city of Gdansk, was a free city, separated from Germany as a result of the Treaty of Versailles, until the Nazis recaptured it after invading Poland. The sun peeking through the clouds (on a church) suggests that even the heavens approve of Hitler's conquests. 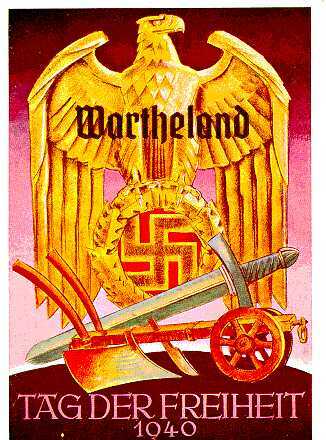 Warteland was part of Poland incorporated into Germany after the Polish campagn. The caption translates “Day of Freedom 1940”. Thanks to Rick Hudson for the scan. 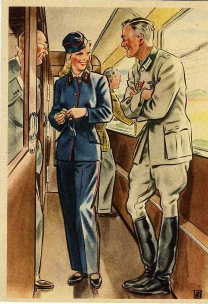 This is one of a huge number of postcards with a military theme. 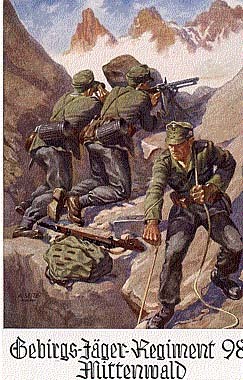 It shows a group of mountain troops on maneuvers in the Bavarian Alps. This is one of a series of postcards on the theme “Women working for you,” intended to be sent to solders. Click on the thumbnail for a page with seven postcards from this series. This is one of a series of postcards on various service units, anti-tank gunners in this case. Thanks to Jim Finkle for the scan. Go to the German Propaganda Home Page.